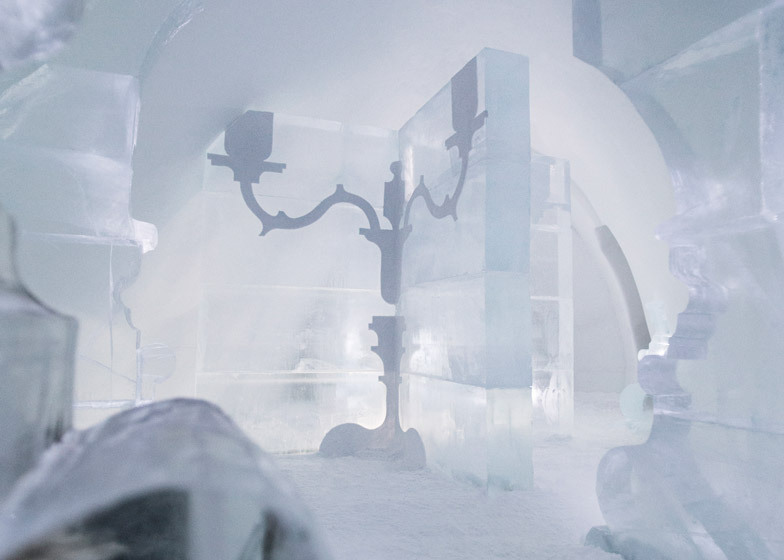 A rainforest populated with orangutans, a giant chess board and floating jellyfish are sculpted from the snow and ice used to create the rooms inside this year's Icehotel in Jukkasjärvi, Sweden (+ slideshow). 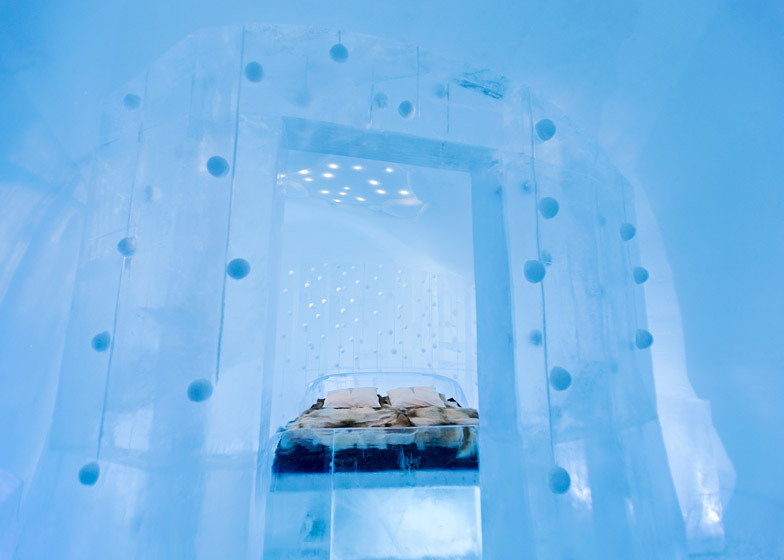 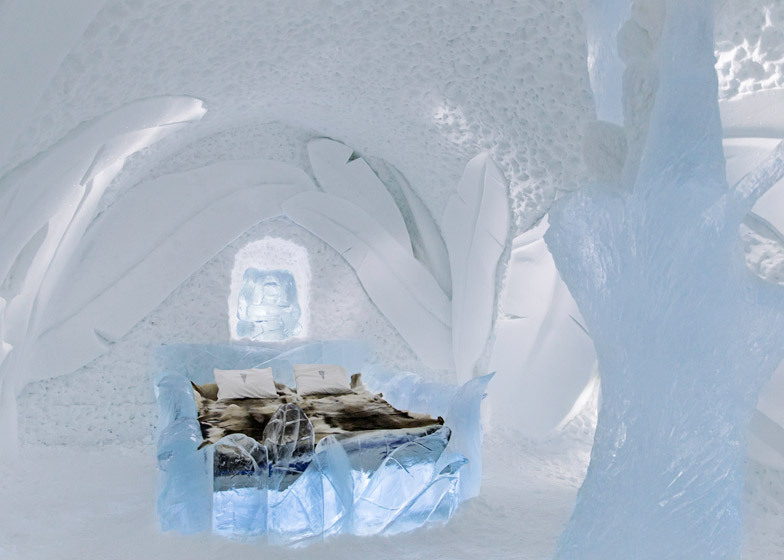 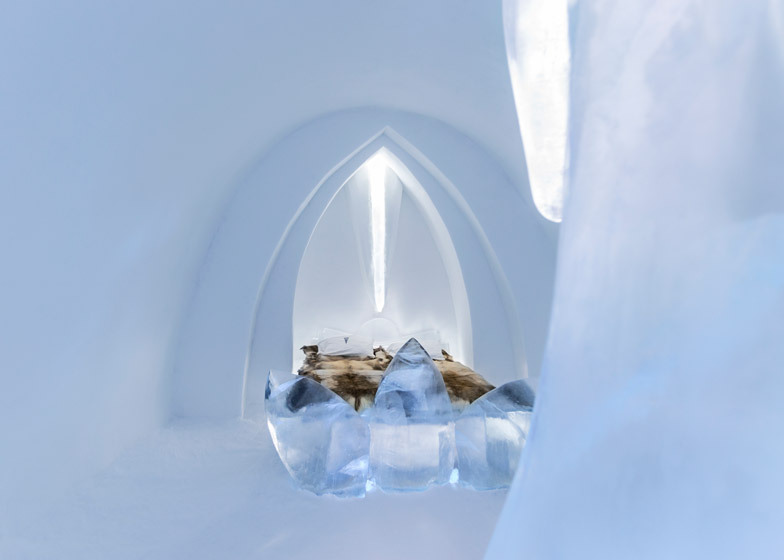 Located 200 kilometres north of the Arctic Circle, the Icehotel is built from over 30,000 tonnes of "snice" – a mixture of snow and ice taken from the nearby Tornu River. 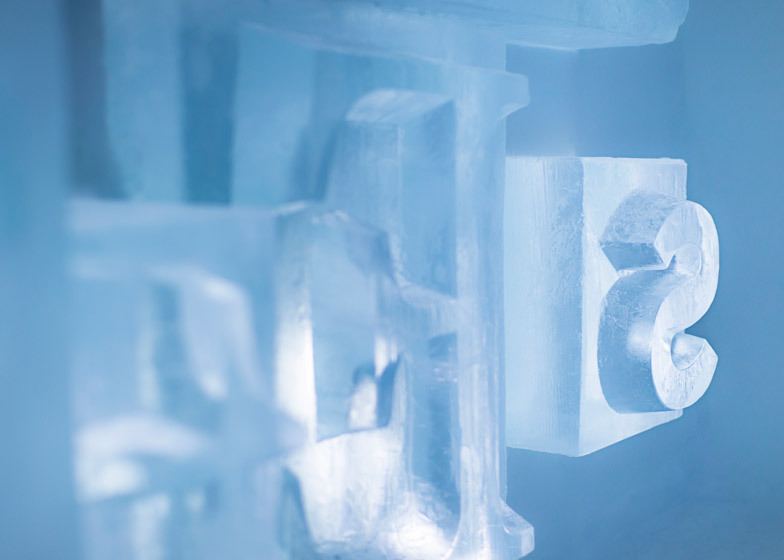 A further 1,000 tonnes of ice is used to create furniture and fittings inside, where spaces include a bar, a reception, luxury suites, a main hall and a church. 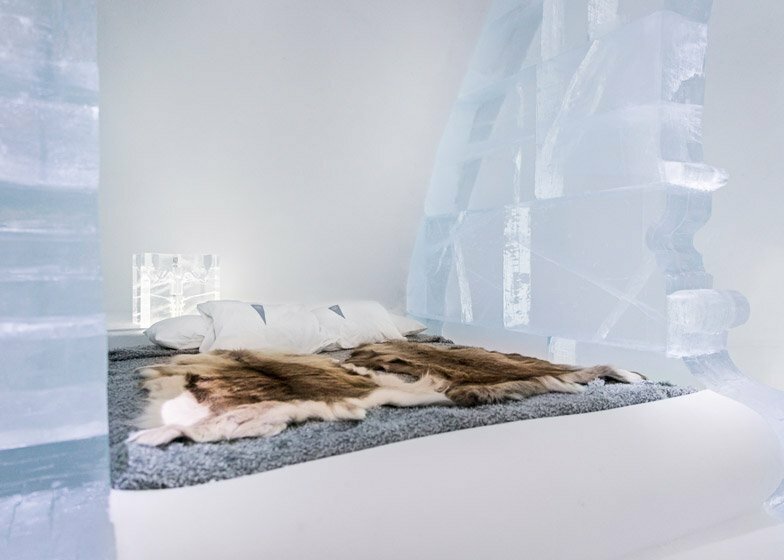 A new feature designed specifically for this year's iteration of the hotel – which is rebuilt from scratch every winter – is an "ice theatre". 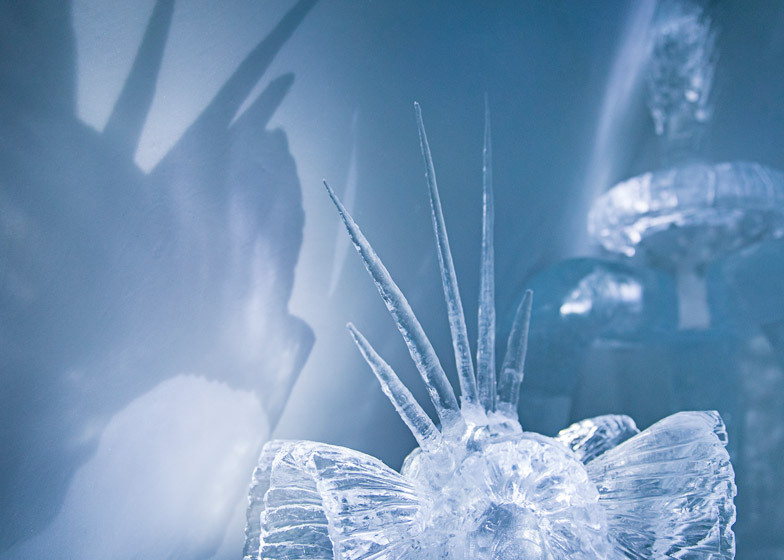 This will host a series of music, comedy, operatic and dance events throughout the season. 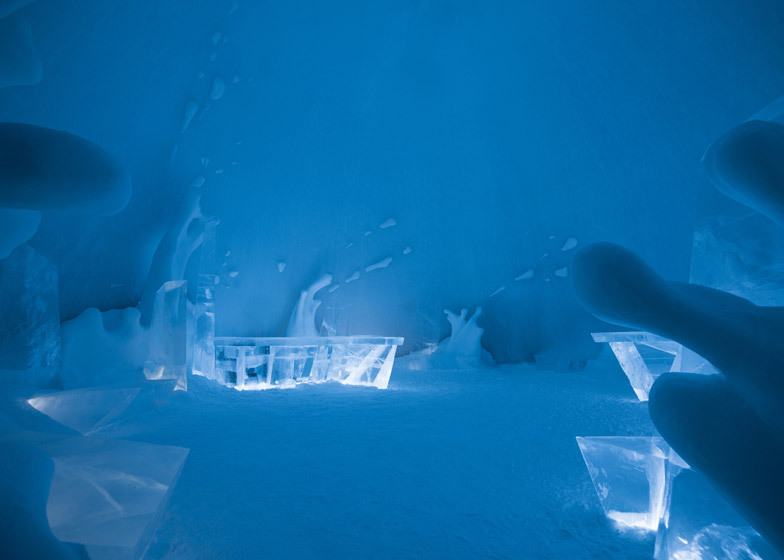 The Aurora Hall's domed ceiling was created by spraying water on to giant balloons, which act as a mould and are burst once the water has frozen into shape. 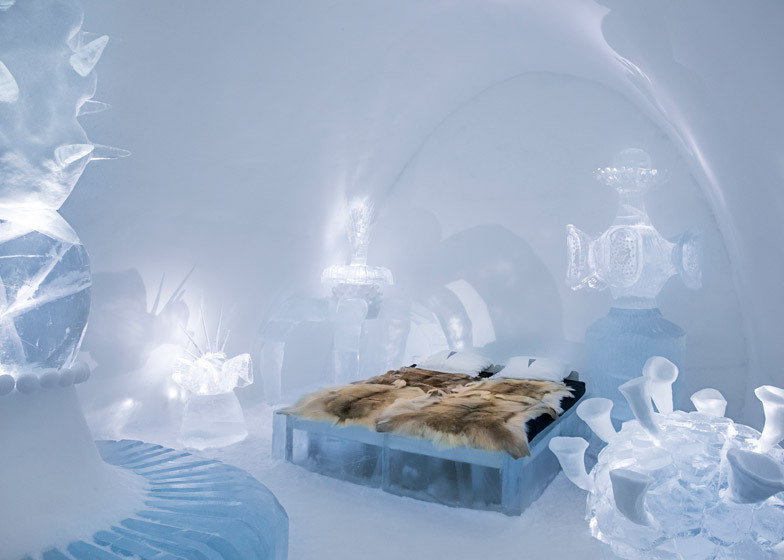 Its inner walls are made from solid ice rather than snice to provide better acoustics. 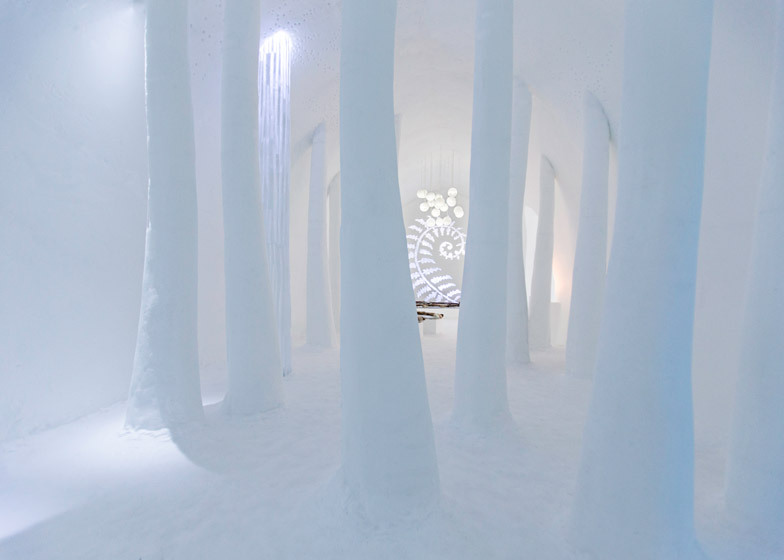 A layer of fluffy snow is added to the surfaces to enhance the interplay of light within the space. 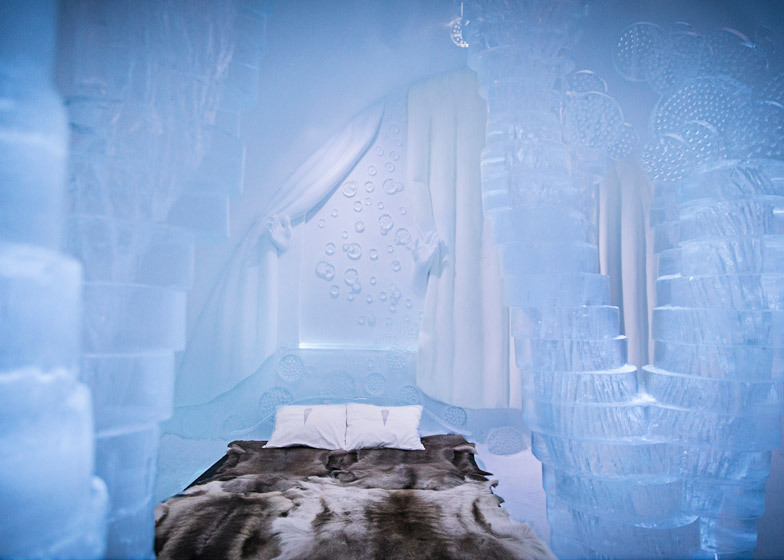 Of the 61 guest bedrooms, 16 were created as frozen Art Suites designed through collaborations between different creatives. 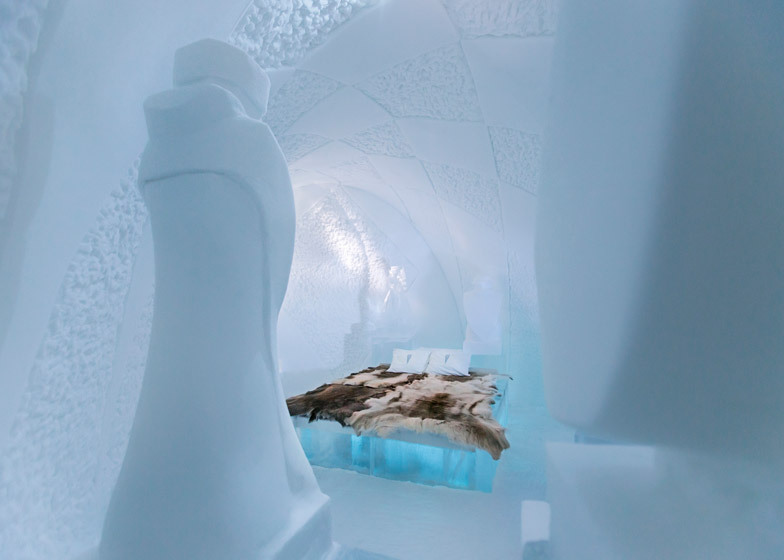 "After the basic structure of the Icehotel is built, each artist has about three weeks to complete their design in the Art Suites whilst other artists work to add the details to the remainder of the Icehotel, including the Icebar and Chapel," said a statement from the hotel. 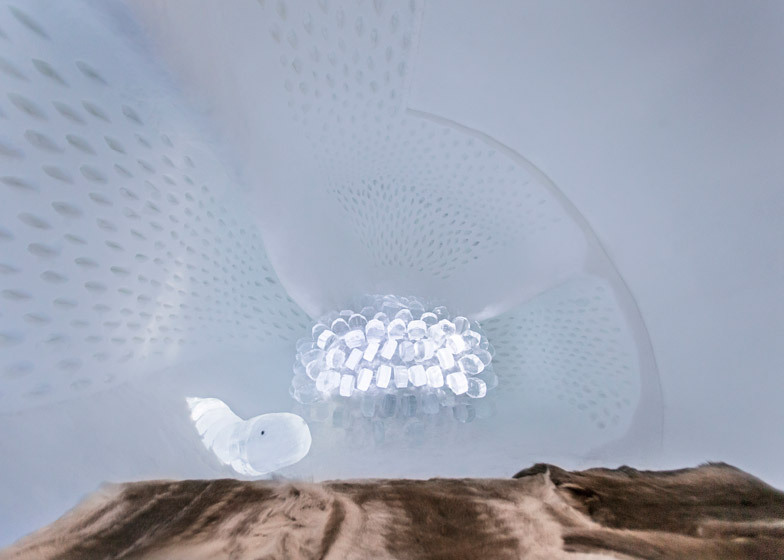 To highlight the fate of the endangered orangutan, Ulrika Tallving from Sweden and Urs Koller from Switzerland created a rainforest scene complete with large sculptural leaves and depictions of the apes. 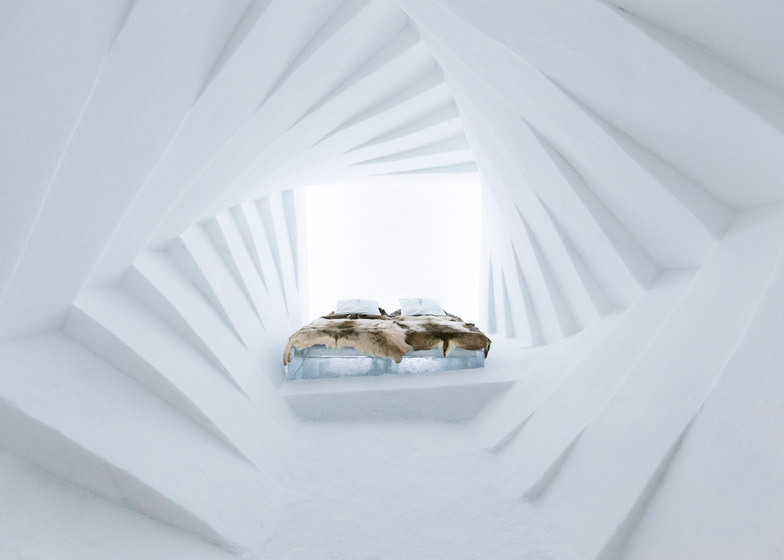 For the Borderland suite, Polish artists Tomaz Czajkowski and Eryk Marks recreated the folk-art decorations of buildings in the villages where their grandparents live in east Poland. 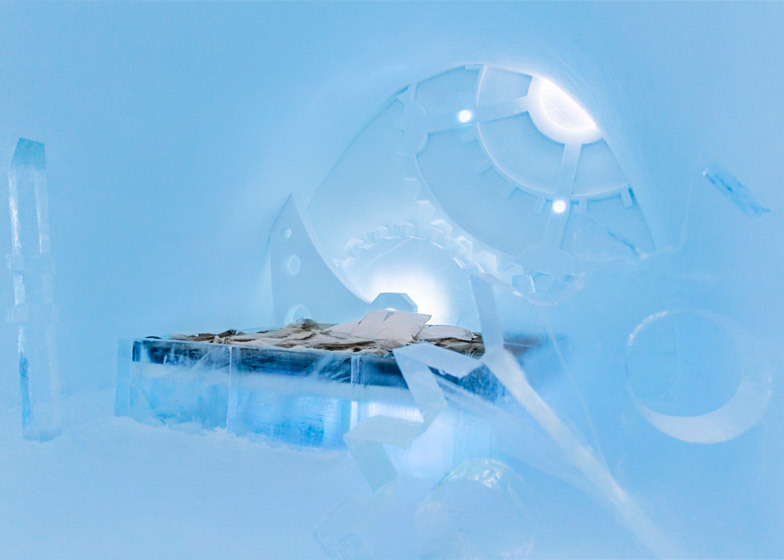 The Time Piece suite features a work by Swedish artists Emma Curden, Theodor Fahlén and Gabriella Bulin that shows the mechanical cogs and inner workings of a clock, frozen in place. 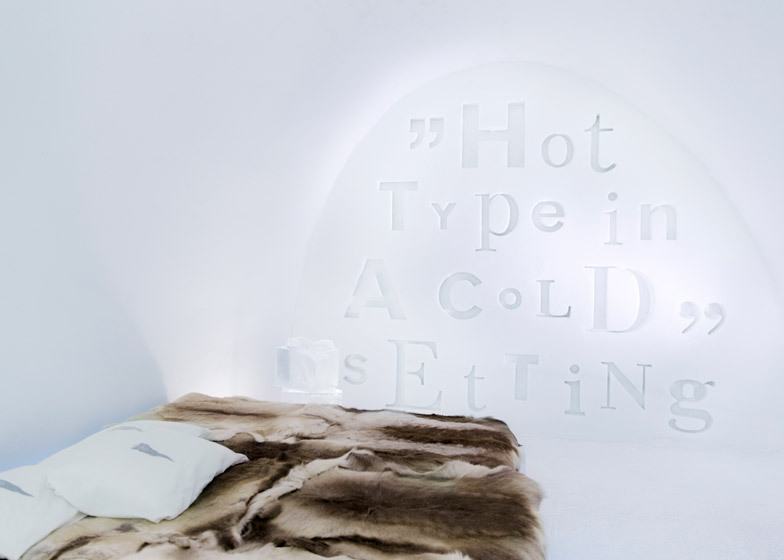 Also from Sweden, Charli Kasselbäck and John Bark played on the words "hot type" and "cold setting" used in traditional printmaking and carved typography into the walls. 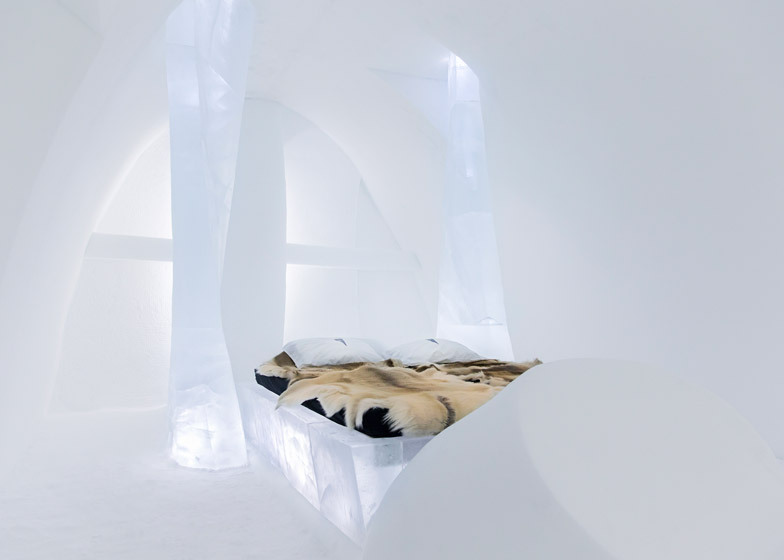 In another suite, sections of the walls and ceiling are rotated bit by bit to create a square vortex emanating from the bed. 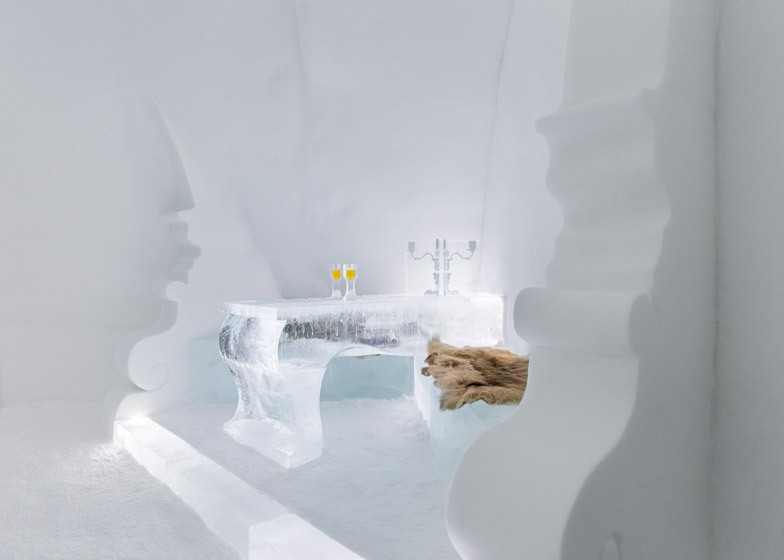 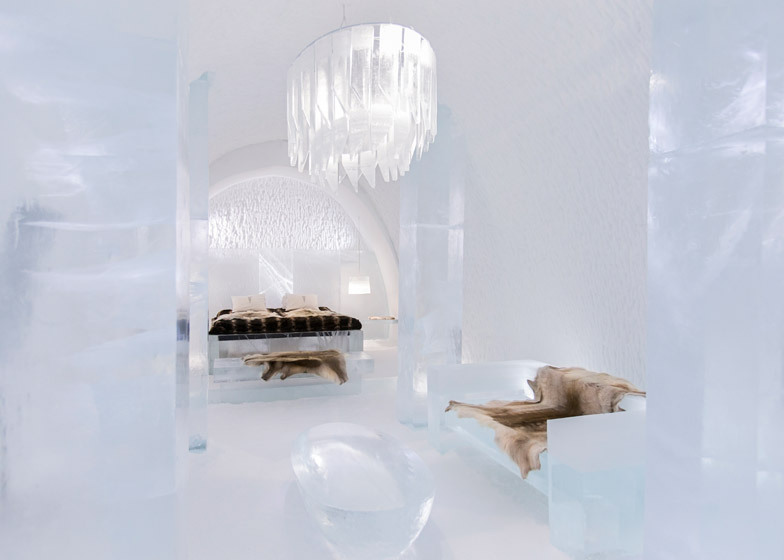 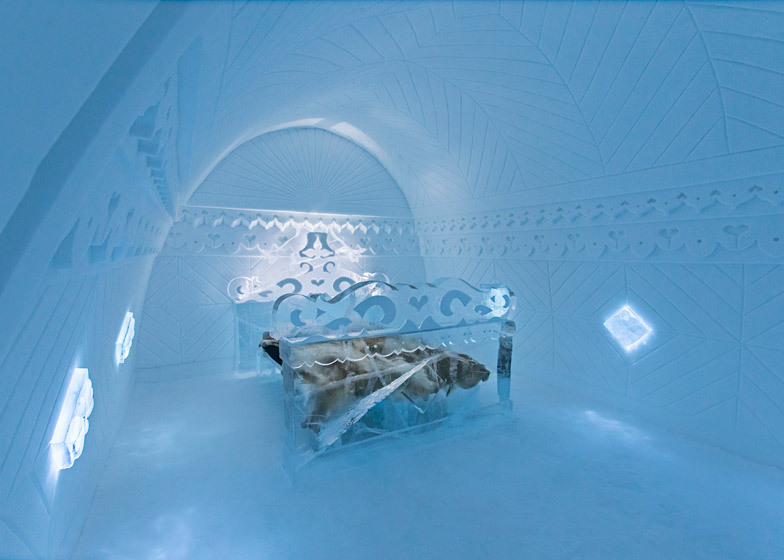 The hotel's Icebar was completed by Italian sculptor Maurizio Perron, Bulgarian architect Viktor Tsarski and Dutch product designer Wouter Biegelaar this year. 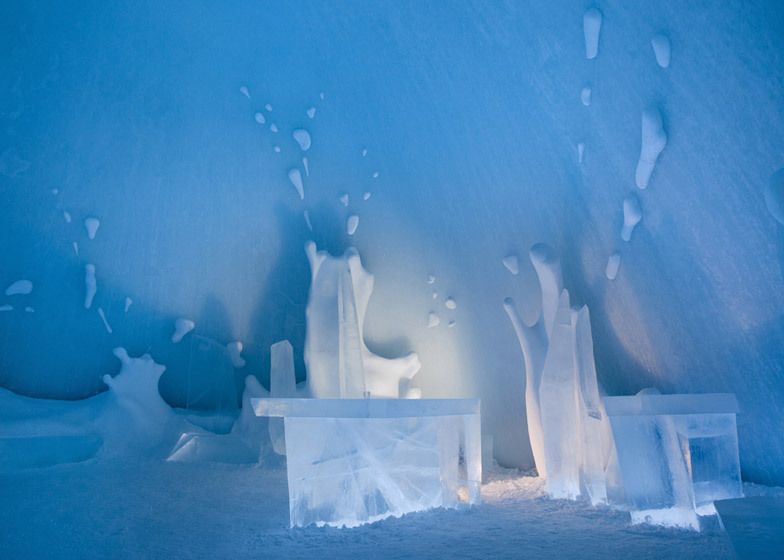 Titled BOOOM!, their design features angled blocks that jut out from the walls and floor to form the counters, seating and tables. 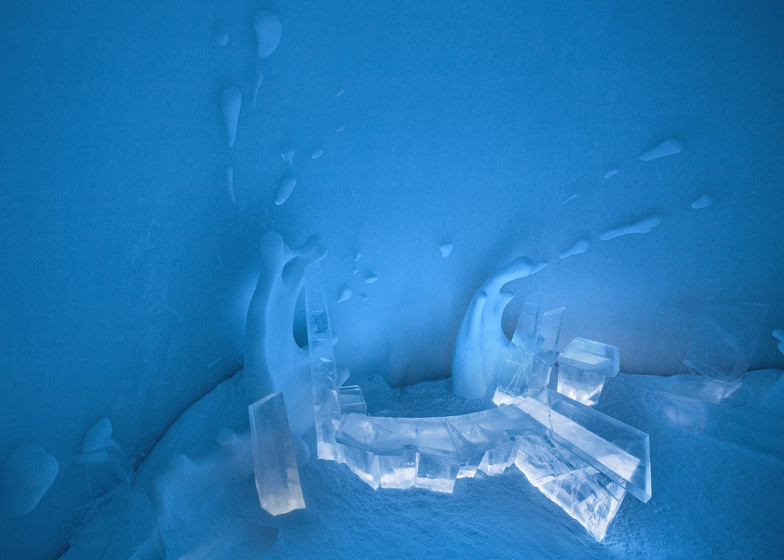 Snow is sculpted into shapes of frozen sloshes of water where the furniture meets the other surfaces. 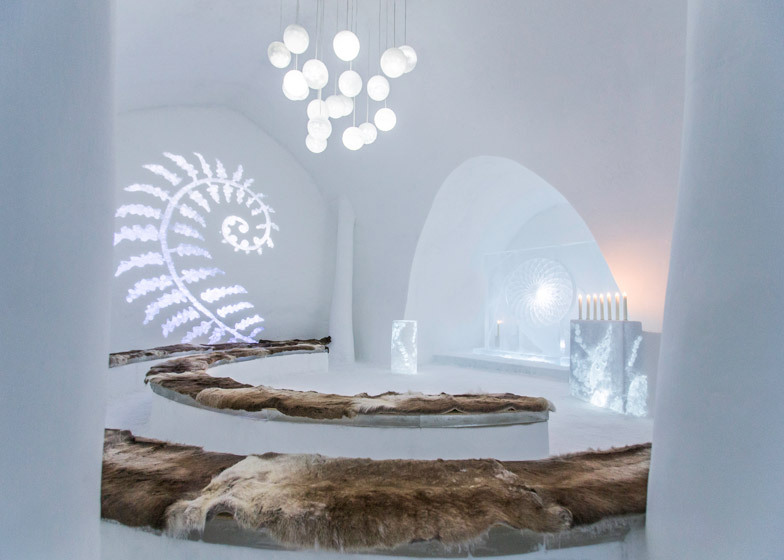 "We wanted to celebrate the 25th Icebar, the heart of the Icehotel, with a big bang," said the team. 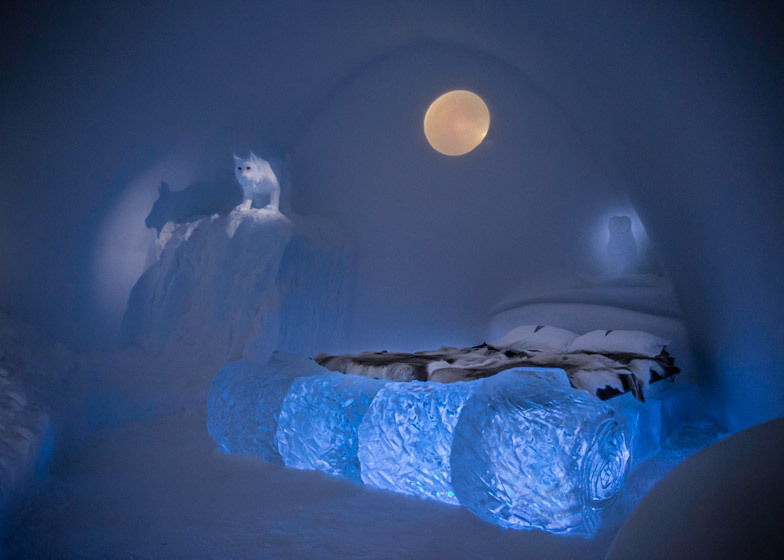 "BOOOM! 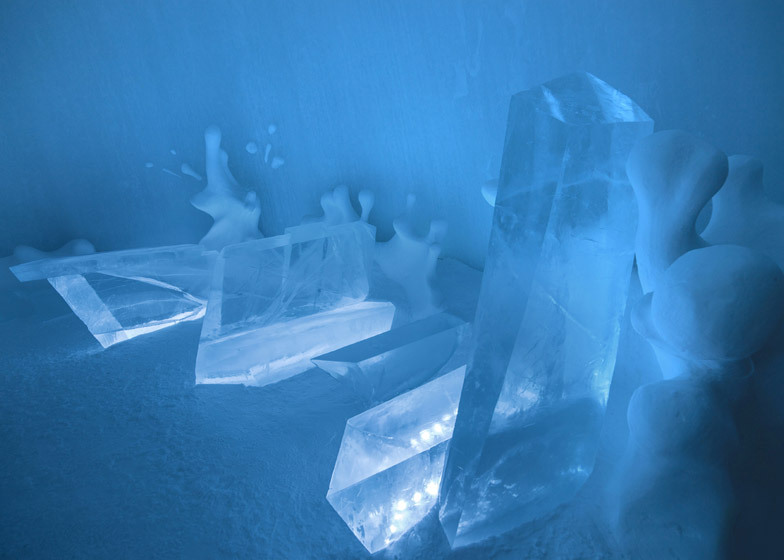 is an ice explosion where sharp ice blocks shoot through the dome. 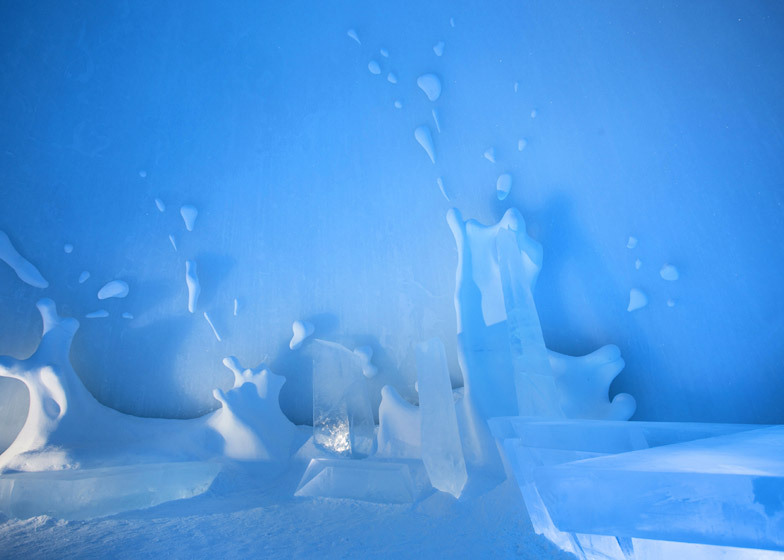 Where the ice clashes to the wall, waving splashes of snow appear." 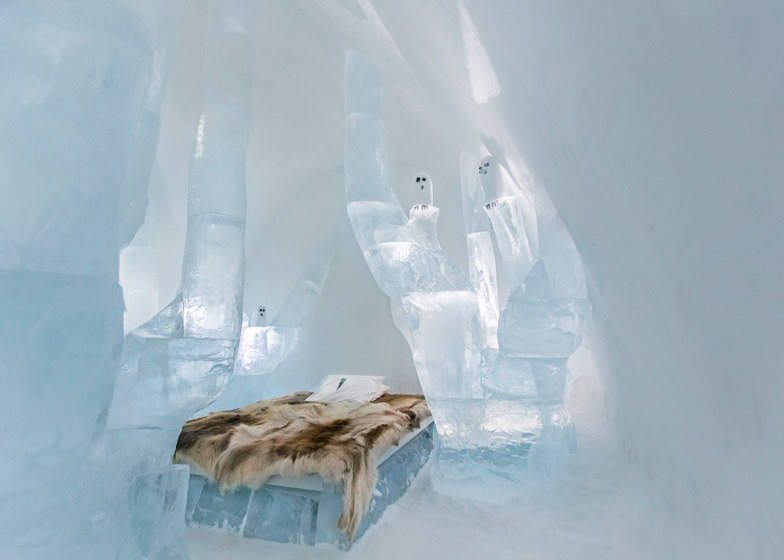 The ice portions of the hotel, which also has "warm rooms" available on the same site, are open for public bookings until April. 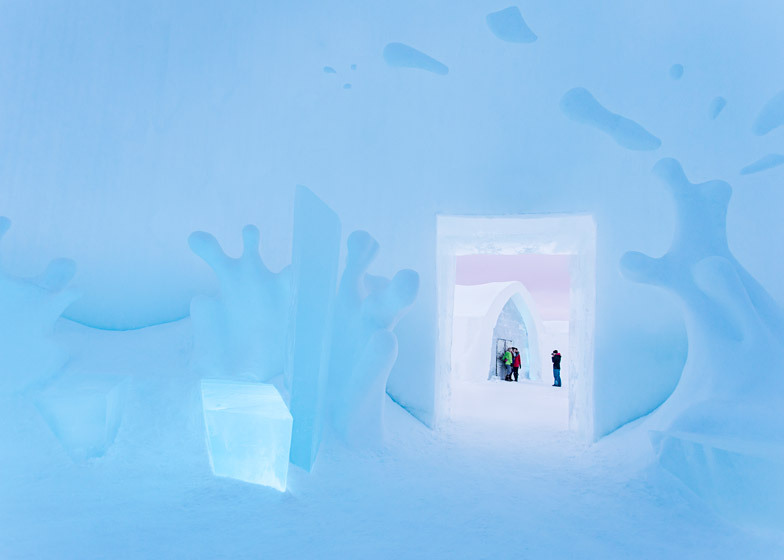 Photography is by Paulina Holmgren.